Try to handle the flowers as little as flower, taking extra care not to touch the flower head themselves. 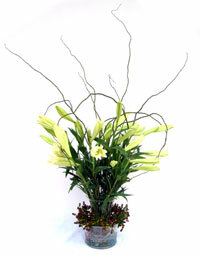 Some florists will use flower food in their soaked foam or water in vase arrangement. Top up the water daily, but do not empty the vase otherwise you will lose all the food nutrients in the water. However, if the flower food solution becomes cloudy, you need to replace it entirely with fresh water. As flower foods are available only in certain florist shops and are rather expensive, we would usually recommend customers to use alternatives such as paracetamol such as ‘Panadol’ or a small teaspoon of washing detergent. It may sound odd, but these solutions actually contains bacteria killing agent that will destroy most bacteria that cause your flowers to wither. In addition, you may also add a few tablespoons of 7-UP or Sprite to the water. These beverages contain citric acid which is one of the ingredients contained in a packaged of flower food. Always cut fresh flowers with a sharp knife. If possible, re-cut stems by removing one to two inches. Be sure to use a sharp knife or clippers that will not crush the stems. A dull knife or scissors can crush the stem of a flower and reduce the amount of water that can reach the bloom. When you are cutting the stem place the knife on an angle and slice through the stem. Keep your flowers in a cool place until you can get them in a fresh water solution. Hard, alkaline water shortens the vase-life. If you live in an area with hard water, you can use a de-ionizer or add some citric acid to the water. Too much sodium in the water is poisonous to carnations and roses while too much fluoride will damage Gerbera, Gladioli and Freesia. Lukewarm water is recommended for just a few flower types, like Heliconia. It can be very damaging for some other kinds of flowers. Never use hot water - this will damage any type of flower. Never leave the flowers in a closed car or in any other place that is too hot. Avoid as far as possible long transports and dehydration. Do not place the flowers in the draft and keep the wrapping around the bouquet as long as possible. Dehydration can lead to the formation of air bubbles in the water vessels, which will hinder the flow of fluids even after the flowers are put into water again. Avoid freezing temperatures. Some types of flowers will die within seconds at such temperatures. Ensure sufficient air circulation, but without any draft. Flowers emit ethylene, a plant hormone that will, at high concentration, block the vessels and accelerate the decay of the tissue. A certain air circulation is necessary to avoid high concentrations. High quantities of etylene can also be caused by cigarette smoke, exhaust gases or the vicinity of ripe fruit, especially strawberries and tomatoes. Among the flowers most susceptible to ethylene damage are Agapanthus, Antirrhinum, Bouvardia, Campanula, Carnations, Delphinium, Euphorbia, Gypsophila, Lilien, Phlox and Trachelium. On some flower types you may notice a discoloration on the ends of the stems. This is in most cases a result of pretreatments done at the growers place to improve the quality and vaselife of the flower. Such discolorations are not a sign for disease.